No update on the Titan yet. No new videos yet. No quality photos of finished minis yet. No essays on ideas about D&D 5th Edition or reviews of board games or anything else yet. But I did accidentally take a great minis picture with my phone, so here that is! I finished more of the Angels of Condemnation, so here are photos of five more! This guy has some giant bullets at his feet, which I believe came from a Mechwarrior: The Dark Age miniature. Maximir, the Leviathan Dreanought of the Basilican Space Marines Chapter, stands finished! The base has been painted up, some more scrollwork was added to the left shoulder, the cross was added to the right shoulder, and various nicks and scratches were painted in. 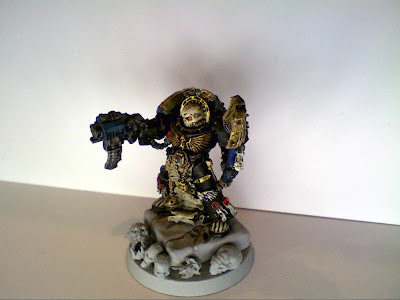 Also, his torso-mounted heavy flamers were painted. Here are more photos! 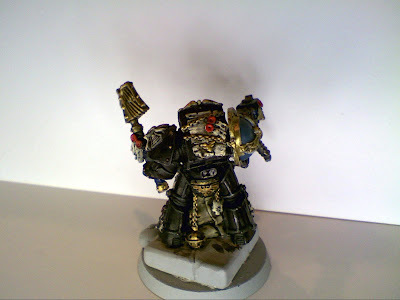 Continue reading Leviathan Dreadnought Finished! Introducing… the Angels of Condemnation! 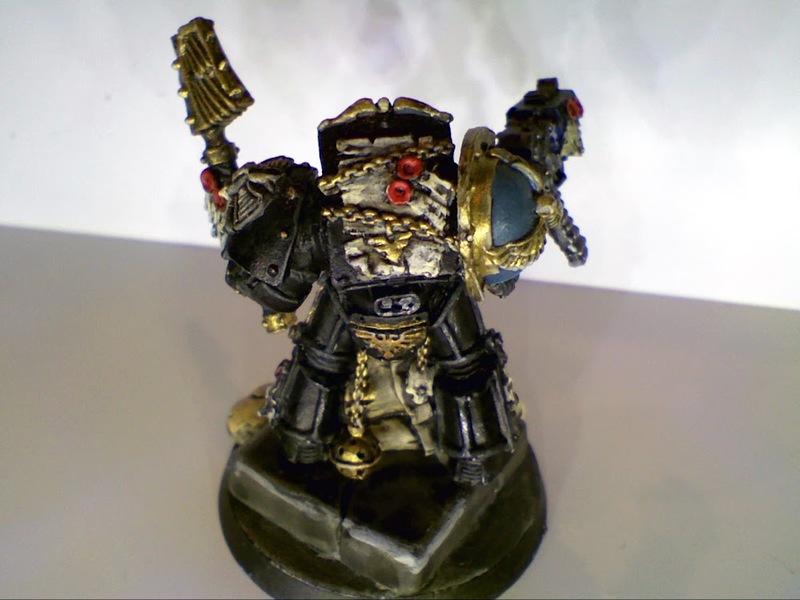 So… the Deathwing are basically an army made entirely of Terminators. What’s not to love? Well, I didn’t love what it would cost to buy that many Terminators… so an army of Terminators became something of a pipedream. 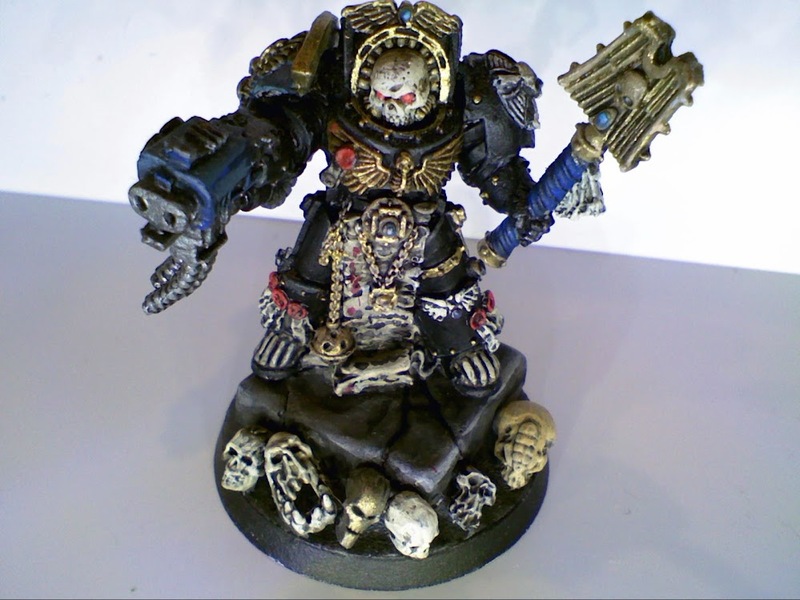 Enter Dark Vengeance, a starter set full of Dark Angels, containing five Terminators. This set flooded the secondary market, such that a person could get 5 Terminators on ebay for $10 (instead of $50 or $60). So I did what any reasonable person would do – bought a ton of them and started cutting them up and customizing them. I am, of course, dedicated to no two models looking exactly the same (even before they’re painted), so this was a fun pet project to make four poses look like fifty poses. 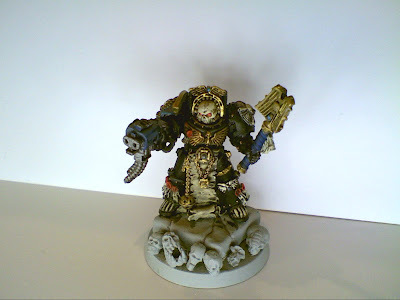 In the end, I also used the Deathwing Terminators box, both for extra bits, and because Deathwing Knights look amazing, so I wanted some of those. 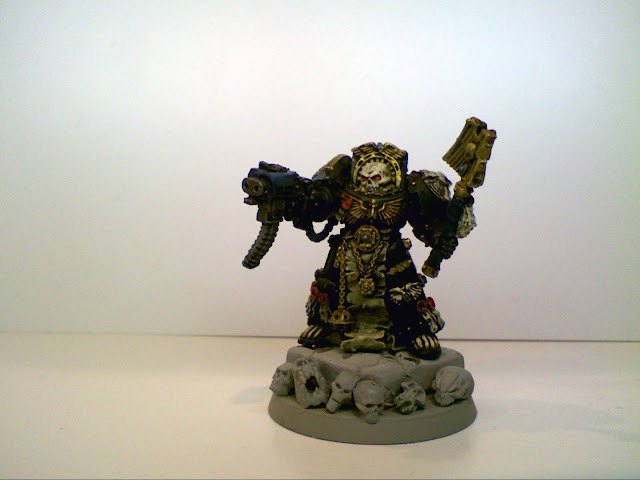 Early on, I was going to simply paint them like my custom Codex Chapter, the Basilicans, and simply have them “count as” Deathwing… but I decided that I like inventing fluff (and the Dark Angels are a cool parent Chapter to have), so instead I invented… The Angels of Condemnation! Continue reading Introducing… the Angels of Condemnation! So I’ve made great (if slow) progress on the Leviathan Dreadnought (affectionately called “Max”). After priming, I put on my blue basecoat. This didn’t go so well – not sure if the primer didn’t take, or the paint mix was wrong, but I had to strip him once and still had problems with the second try. Still, I got it done eventually. Paper plates are my palettes, my model trays, and my lifelong friends. I really loved Forgeworld’s Leviathan Dreadnought when I saw it, and the model did not disappoint. It’s massive and hefty, which is what I think of when I think “dreadnought.” I got a siege claw and a storm cannon to go on for now. I magnetized the weapons at the elbow, which seemed easier than the shoulder joint. I also magnetized the flamer/volkite weapons at the waist. I didn’t magnetize the missile launcher/phosphex discharger – there’s not much area to drill into except detail I didn’t want to ruin, and it’s an easy piece to tack on with wall mounting putty if I want to. My favorite part of assembling it, though, was making a nice decorative base. Using the front bit of a Rhino (left over from a Demolisher), a Rhino door, Chaos Space Marine bits, and some Rhino tracks I got in a bits box, I gave the Leviathan Dreadnought something nice to stand on. Assembled and posed, this is now one of my favorite minis that I own. For this picture, I tacked the model together, but I intend to paint it separately (base, legs, body, head, top cover, and weapons individually). Stay tuned for a painting adventure! In my previous video post, How to Not Magnetize, I explored the world of using wall putty instead of magnets. The Space Marine Centurion kit has long intimidated me. I like to build “What You See Is What You Get” models (meaning that the model itself shows what weapons it is using in a game) not because I play with anyone who requires it… but because it’s kind of a fun challenge sometimes. The Centurion Kit has 3 chest weapon options, 4 arm weapons, and 2 more options for one of those arm weapons. That’s… a lot of permutations. And the Centurions have very tiny areas where these weapons attach, especially the chest weapons. They are so tiny. So very tiny. Magnets don’t really seem to be an option for the Centurion, not realistically. But mounting putty? That’s a whole different story. The putty option isn’t perfect. Sometimes, it’s hard to get the right amount. Sometimes, it isn’t enough. But… considering what a mess drilling holes for magnets could be, mounting putty remains a really solid option for building a completely flexible unit without buying a million models, or asking opponents to pretend the lascannons are heavy bolters. Don’t get me wrong – I think people who are strict about that kind of thing are likely assholes, but I do enjoy the challenge, and I really enjoy using all the parts that come in the box. Once again, mounting putty is your friend! I finished Chaplain DuChamps, so here are a few pictures of him all stitched up. Enjoy! Note that the base is painted, and detail was added to the scrolls hanging from his wasit. 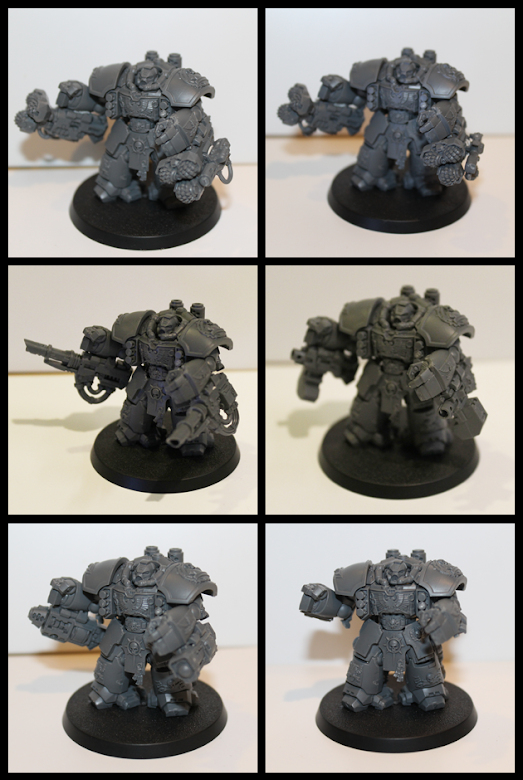 Later this week – modified Chaos Cultists, and a Deathwatch squad!